Cader Idris rises over Fairbourne Railway on the Mawddach Estuary near Barmouth, Dolgellau and Tyddyn Mawr Guesthouse Bed & Breakfast. The Great Little Trains of Wales are famous for their scenic rides. Talyllyn Railway is just a 20 minute drive from the Farmhouse. This narrow gauge railway was built in 1865 and was one of the worlds first preserved railways. Ffestiniog Railway is a steam-hauled narrow gauge trains running along 13½ miles from the coast at Porthmadog to the mountains in Blaenau Ffestiniog. The Fairbourne Steam Railway is a tiny railway situated on the Mid-Wales coast on the south side of the Mawddach Estuary. 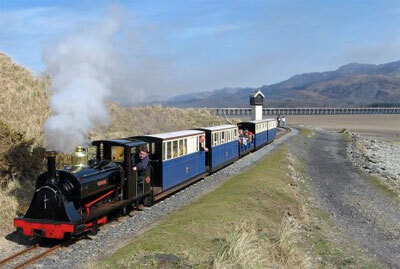 Attractions of Snowdonia - other Tourist Attractions located in the Snowdonia National Park. "Brilliant location and even better cuisine!" - John & Sonia, Scotland. 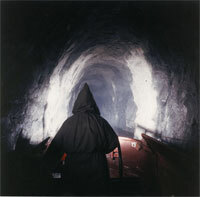 Explore the myths of Arthur and the inside of a slate mine at the same time at King Arthur's Labyrinth. 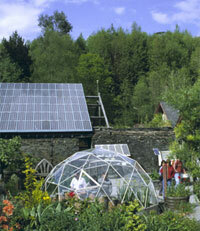 The geodesic dome, organic garden and solar roof at the Centre for Alternative Technology. You could always just stay at the B&B, be pampered, and enjoy the views.